Tulsi saplings to each awardee along with books, trophies & certificates from the only female Guiness book entry from India, world-famous mountaineer, Padamshri Santosh Yadav, in front of their parents, made the day different and memorable for the young 435 awardees of the school. 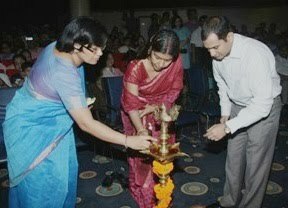 Other dignitaries included Chairman SVIS Mr. Sailander Solanki, Chairman VGS, Mr. Rajiv Solanki, Principal VGS, Ms. Kavita Soni. SVIS believes in providing a holistic platform for the students where in they are given appreciation and incentives not only for their academic performance but also for their various multiple intelligences. The Principal SVIS, Ms. Nita Arora congratulated both the parents and the children and motivated the parents to encourage multiple intelligences in their children. She enlightened the parents about this theory which proposes that each child has some talent that need to be identified and groomed with patience, understanding & maturity on the part of parents & teachers alike. The programme began with the lighting of the lamp followed by a beautiful performance on the Saraswati Vandana by the students. The school choir made the stage come alive with the song “We are the Best” – that is to be launched for the Commonwealth Games by the SVIS family. The event included a plethora of programmes that exhibited the talent of the children like ‘Krishna Dance’, “Korean Dance”, a skit on “Multiple Intelligences” and much more. The awards were given out for various categories like Proficiency in subjects, Overall Excellence award, Innovative hands, Mozart, Tapping Toes etc. The Chief Guest Padamshree Santosh Yadav felicitated the parents, teachers and the students. She motivated and inspired the children with her beautiful words of wisdom. 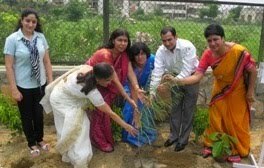 She also presided over a tree plantation ceremony conducted in association with The Lioness Club, East Patel Nagar. ‘Tulsi Saplings’ gifted by the The Eco-Club of school to each awardee for nurturing will help in cleaning the cobwebs of mind and also will aid in purifying the nature.